Last night the design team behind the massive flood barrier park on the east side of Manhattan presented updated designs to the public at a meeting of Manhattan's Community Board 3 (CB3), whose board ultimately approved the designs. Representatives from One Architecture and Urbanism, Mathews Nielsen Landscape Architects (MNLA), and the Mayor's Office of Recovery and Resiliency discussed their proposal at P.S. 20 on the Lower East Side in front of an auditorium generously peppered with community members who would be some of the park's local users. 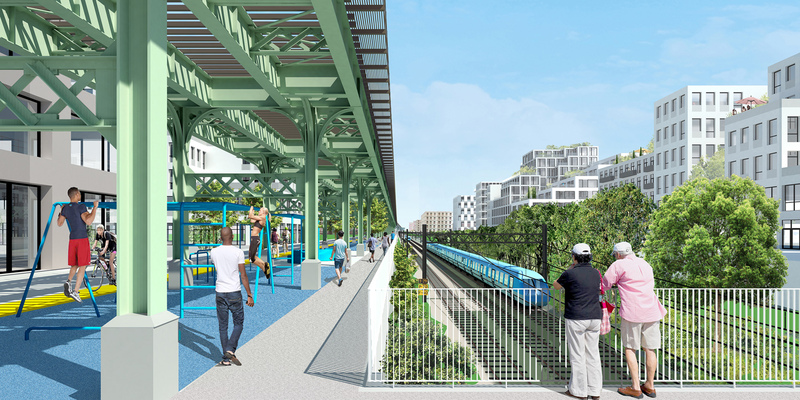 The overall goal of the plans, which are officially known as the East Side Coastal Resiliency Project (ESCR), are to prevent catastrophic flooding while improving the quality of and access to parkland along the East River from Montgomery Street on the Lower East Side to East 25th Street. East River Park already occupies most of that stretch, so plans will improve existing parkland but add roughly 11 linear blocks of green space. The preliminary designs (PDF), a collaboration between the city, One Architecture, MNLA, AKRF, and Bjarke Ingels Group (BIG), were reviewed by CB3's parks committee on March 15 and presented to the full board yesterday. Readers can learn all about the proposal here. 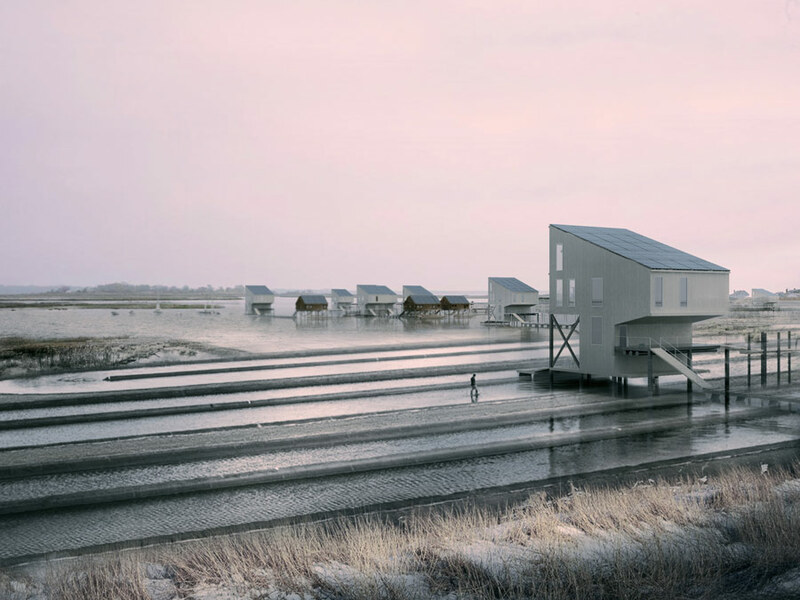 Mathew Staudt, senior designer at New York's One Architecture, told the assembly that the team hoped to rely on flood walls and traditional levees, plus earthen levees as space allows, to minimize the use of functional but not-too-pretty movable gates that can close to protect inland areas from rising waters. The flood protections are built to oppose a 100-year coastal storm in the 2050s, a model that assumes 2.5 feet of sea level rise over the next three-plus decades. 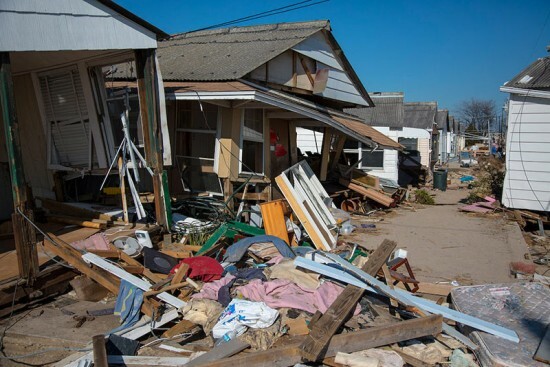 Carrie Grassi, deputy director of planning at the Mayor's Office of Recovery and Resiliency, noted the ESCR is also shooting for Federal Emergency Management Administration (FEMA) accreditation. Park access played a big role in last night's discussion. Per community feedback, the team adjusted the design of the Delancey Street pedestrian bridge, subbing a sloped walkway for a ramp-and-stair set and widening the path. On East 10th Street, the team is creating a new bridge with ramps and stairs. The adjacent playground will retain its equipment, but the firm is adding a grade change and new planting to help with flood control. Trees, explained MNLA Principal Molly Bourne, will be saved in large groves, and the firm is looking to create a new forest for the park. Although the project timeline stretches into 2024, stakeholders have until 2022 to spend $335 million in federal money, so the team hopes to move to final design stage soon. The project is also supported by over $400 million from the city. The audience mainly sought clarity on some of the finer points of the design, like the size and location of the ballfields (Bourne said there will be the same amount of active recreation space but MNLA has rotated the soccer field). Like any major public improvement, the proposal takes time to be critiqued and adjusted, but the ESCR is approaching some significant milestones. The draft of the project's Environmental Impact Statement (EIS) is due this July, and its lengthy public review (the ULURP, short for Uniform Land Use Review Process) begins the same month. Final design proposals should be ready by winter. If the ULURP goes smoothly, shovels are slated to hit the ground in spring 2019, and the project should wrap by the end of 2024. Bjarke Ingels Group (BIG) has unveiled a speculative design proposal that aims—among many aspects—to populate the San Francisco Bay with floating villages as part of an effort to buttress the region against climate change–induced flooding. The proposal is undertaken with One Architecture + Urbanism (ONE) and Sherwood Design Engineers and is among a slate of ten newly-announced schemes generated for the Resilient By Design Bay Area Challenge, a regional competition aimed toward generating ideas for how to best protect the Bay Area from rising sea levels. Projections for the region call for a minimum of four feet in sea level rise under moderate warming conditions by 2100. The changes would bring flooding to the area much more frequently than is currently the case, a development that would devastate coastal communities. Many of those communities are built atop landfills over former marsh areas and tidal zones. BIG’s proposal takes two routes in its effort to achieve its ambitious goals. First, the plan calls for restoring Islais Creek—a stubby inlet on the San Francisco side of the Bay sandwiched between the Dogpatch and Hunters Point neighborhoods—as part a larger plan for retrofitting the entire San Francisco Bay’s edge. 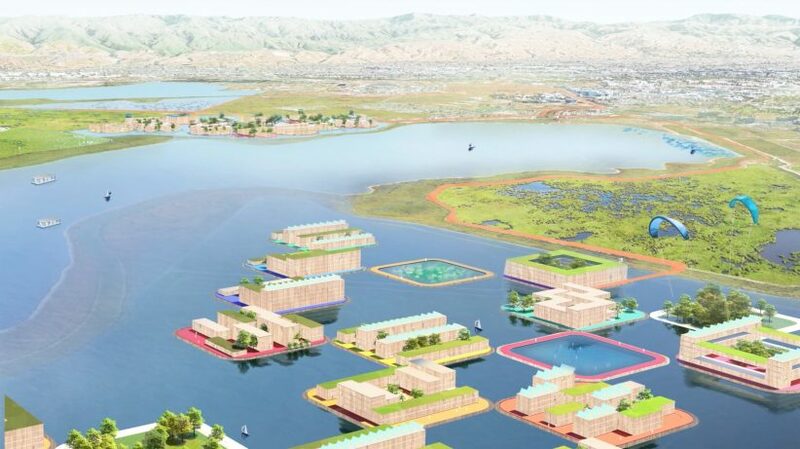 BIG’s conceptual masterplan for the San Francisco Bay envisions restoring the wetlands along the water’s edge lost to development while redistributing new population centers into the bay to create an urban archipelago connected by public ferries. The plan also proposes relocating and expanding the existing network of industrial, port, and warehouse activities into more compact configurations surrounded by trails, marshes, and parkland. The scheme also calls for modernizing a stretch of Interstate-101 as a “machine for autonomous collective transit,” as explained by BIG founder Bjarke Ingels in a presentation video. The plan would create a Bus Rapid Transit loop in the south Bay that will anchor and connect new density nodes. The plan would extend to the southern edges of the Bay, as well, where existing salt palm and tidal marsh areas will be revisioned into experimental urban agriculture zones. The proposal is joined by schemes from James Corner Field Operations and Hassell+, among other multidisciplinary groups, and follows a year-long research period that brought together designers, landscape architects, planners, politicians, and community activists from across the region. For more information, see the Resilient by Design: Bay area Challenge website.